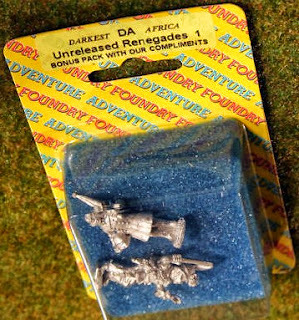 Those concepts were done for me by the amazing Wayne England 14 or 15 years ago, when I was out of the miniatures industry. My plan was that I would come up with three backgrounds for the three groups of concepts (Fantasy, Apocalyptic Survival and sort of Victoriana) and put them to one side, on the off chance that Marcus, when he grew up, would want to enter the wacky world of toy soldiers, thren there would be a ready-made platform to launch from. I copied Wayne’s art onto discs at foundry. Years later I discovered that some bugger had got the images from the computer and put them all up on the wall. This was upsetting at the time: nobody wants to see their ideas flung out into the universe before the time is right. One thing led to another, and after a strange and completely unforeseeable series of bizarre events and revalations, we have ended up with the previous management gone and Marcus running a somewhat bashed about version of the foundry that I used to run: and that my father ran before me. Obviously: we would have liked to have just got on with the three new ranges based on Wayne's remarkable concepts and my backgrounds. It would have been a nice cleanly orchestrated start. We would have burst unexpectedly into an astonished and delighted world of gaming with at least one of the systems by now. However, we felt that pulling foundry back together is a worthwhile thing: foundry have had a significant part in the history of our hobby and in the story of the Ansell family. So it was something that we could not just let go. Putting foundry back together again has been (I’m searching for an adjective here…. )… interesting… we have all learned a great deal through the process of having to steadily rebuild a big range with a small staff. We are very lucky that our casting/mould making team of Steve and Ronnie has stuck with foundry through all this strangeness, and that Marcus has been able to more or less pull all the bits back together.